What is American Tribal Belly Dance? 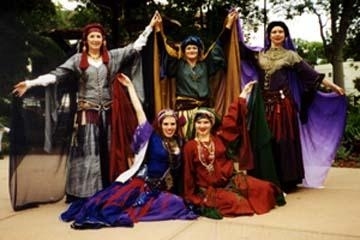 American Tribal Belly Dance was started in the 1980's on the West Coast. It is a specific style of belly dance comprised of many distinct elements. One of the most apparent distinctions is the elaborate costume which often consists of layers of fabric, decorated turbans, and heavy, ethnic jewelry. Tribal Style performance consists of a chorus or circle of dancers providing a backdrop for solos, duets, and trios. Performances are seldom choreographed but rather cued from a vocabulary of movement by a designated lead dancer. This encourages a spirit of team work, awareness and cooperation, all parts of being a "tribe". Desert Rain was started in the fall of 2000, born out of a small dance class taught by Julia Di Verdi. The troupe draws inspiration from a variety of ethnic dance styles to incorporate with Tribal Style Belly Dance. Desert Rain performs regularly in Colorado at shows, fairs, and events. The dancers also teach workshops and dance classes to the Boulder area including classes for teens. Desert Rain is proud to be one of several Tribal style belly dance troupes in Colorado and is dedicated to promote an active "tribal community". Our former director and originator, Julia DiVerdi left Desert Rain in July 2004 to pursue new Tribal Belly Dance projects like the formation of a new troupe called TribalTique. Julia's talent and commitment to Tribal Style Belly Dance has and will continue to enrich the Fort Collins, Boulder and Denver community. We also had the distinct honor of having Nancy Montgomery step in as our director from 2004-2006. In 2006 she moved on to create Bohemian Caravan in Northern Colorado. In 2006, Jennifer Secrist Goran stepped up to lead Desert Rain with her years of experience directing her Tallahassee, FL tribe, Tribe Nawaar. This also moved the base of operations from Fort Collins to Boulder, CO. In 2008 Lisa Goodrich stepped up to lead the group. Desert rain continues to offer dance classes, workshops. weddings, bachelorette parties, performances and more within the Colorado community. As members of Desert Rain we seek to culturally enrich Colorado through our development of ethnic and tribal dances while educating the public about belly dance. We wish to continue to challenge ourselves and grow as dancers while promoting the bonds between the members of the troupe. Most importantly we seek to enjoy ourselves through the experiences of our dance and friendship.